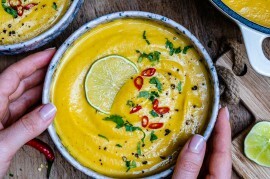 Curried Pumpkin Soup | Tasty Kitchen: A Happy Recipe Community! 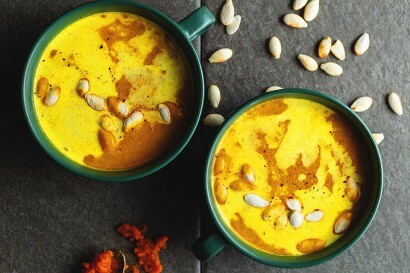 This Pumpkin Curry Soup is so perfect for warming you up on a cold winter day. 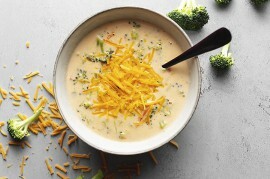 I made the dairy-free version which was so rich and creamy using coconut milk. 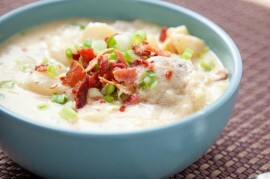 Can you believe this is ready in 20 minutes and has only 5.4 net carbs? Melt butter in a large saucepan over medium heat. Add onions and sprinkle with salt and pepper. Sauté until onions are translucent, about 4 minutes. Stir in curry powder and cook for another minute. Add broth, pumpkin puree, and red pepper flakes. Bring to a simmer and cook for 5 minutes. Transfer to a blender and puree until smooth. Depending on the size of your blender, you may need to work in batches. 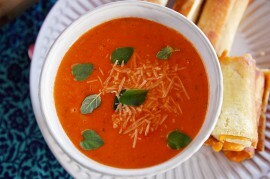 (Alternatively, you can use an immersion blender to puree the soup right in the pot.) 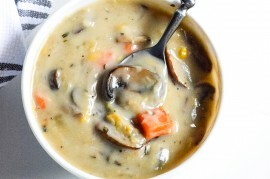 Return soup to pot and stir in heavy whipping cream. Adjust seasonings to taste. Garnish with dollops of creme fraiche and pumpkins seeds. Note: For dairy-free, use avocado oil in place of the butter and full-fat coconut milk in place of the heavy whipping cream. Omit the creme fraiche garnish.